We were really excited when we saw this mirror! It was made in the early 1930s and we think would have been made to be hung in one of the Cadillac showrooms as a promotional item. 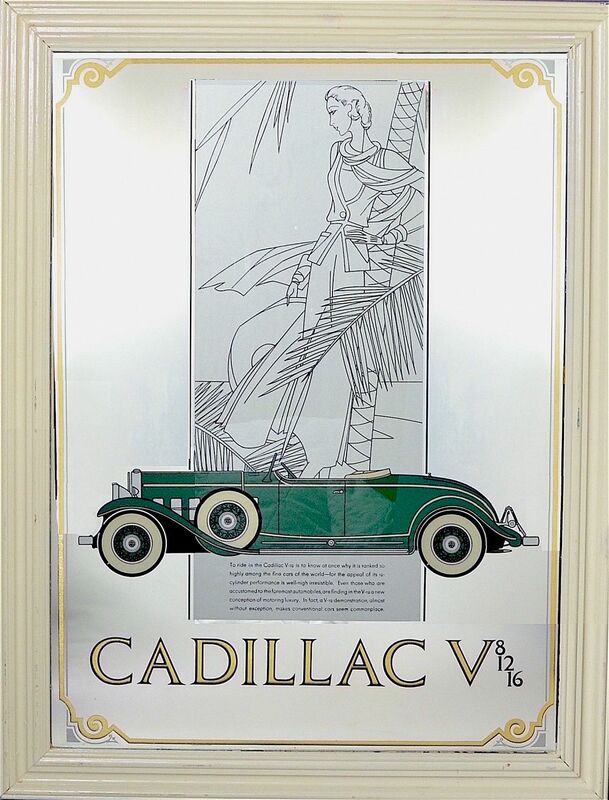 The mirror has been back etched and enamel painted with the image of an open topped green Cadillac that has been superimposed on a rectangular "panel" that is back etched & enamel painted with a fashion line sketch of a woman. There is text below the Cadillac and the words "Cadillac V8,12,16" along the bottom of the mirror below the panel. The edges of the mirror have gold scrolled decoration. It is in a graduated wooden frame that has been given a couple of coats of white paint over the years. There is age to the frame but we cannot guarantee that it is the original one. The fashion sketch is by Leon Benigni. Leon Benigni designed a number of illustrations for Cadillac in 1931 that appeared in numerous magazines in the USA. We have an original Cadillac magazine advertisement from that time that has this same fashion sketch but coloured and with metallic ink that is signed "L Benigni.